Top Notch Material: Curious Chef Encourages Kids to Explore the Kitchen with Their Parents! Curious Chef Encourages Kids to Explore the Kitchen with Their Parents! I think at some point or another every child has expressed interested in helping their parents in the kitchen. I know my oldest used to have a huge fascination with helping me back "goodies." These days, as he is approaching 8, he is more into video games than helping my in the kitchen. His little toddler brother has started to show an interest in helping mommy though! There is a great company out there that facilitates this bonding time between parent and child, and that company is called Curious Chef. We received two separate sets from them which are the cupcake kit and the measuring kit. Since I took a cake decorating class, I love the Cupcake Kit the most. We have had so much fun playing with this as it comes with different attachments that you can make different flowers, and decorations. It also comes with a cupcake pan and silicone cupcake liners. My favorite part is it even comes with something to make it easier to add cream and fillings into your cupcakes! We even got older brother to join in on the fun using this kit, and make some super cute memorial day themed cupcakes! The Curious Chef® 16-piece cupcake and decorating kit is big on creativity and fun and makes it okay to play with your food! This colorful kit has all the kitchen tools a little chef needs to make tasty cupcake creations in the kitchen. The cupcake decorating kit helps you and your little chef prepare a perfect birthday treat, or a special surprise, or just because it's fun. 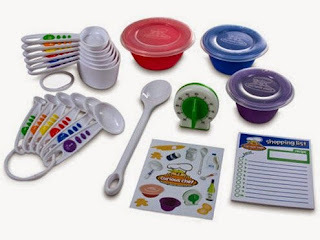 The 17-piece measure and prep kit comes with a 6 piece set of measuring spoons and cups and a kitchen timer, which offer a wonderful way to help teach the concept of both fractions and time. Additionally, the easy grip poly spoon is the ideal size for little hands and the 3-piece prep bowl set with covers are the perfect way to store ingredients or leftovers. Our kids cooking kits help your kids have fun in the kitchen while learning new cooking techniques. I personally think each of these sets are the perfect birthday or Christmas gift! They encourage parents to interact more and bond, and gets kids away from electronics! While my son was growing up, he always enjoyed helping me in the kitchen. Now, my grandson is almost old enough to do the same. 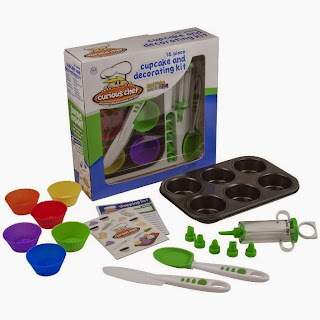 Baking is always fun with little ones and this kit is so cool!